Beautiful floral images using her popular cut-velvet designs. An Italian fabric with a softly crushed and shimmering floral print. 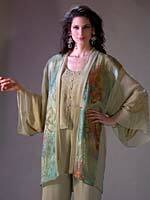 A lovely collection designed with Marian's own floral-print silk chiffons. These were pieces from the era when she was working with Nancy Potts, creating costumes for nine productions of "Hair." This is a print of a dyed image, which came from Marian's own unique Ita-jime dyework. The yardage is a jacquard weave, woven and printed in Japan. Working within the considerable confines of a square, Marian is famous for pushing the envelope a little further each season, while keeping the best of the old styles.